The University of Florida selected Gilbane Building Company as their construction manager to build a new two-story pediatric dental clinic for their College of Dentistry in south Florida. 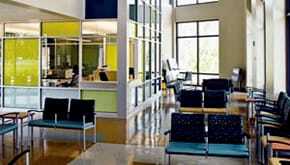 The new clinic was comprised of 21,000 square feet and constructed in the vernacular of the occupied campus of Florida SouthWestern State College. 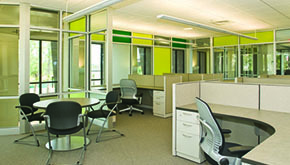 Working with an aggressive schedule, the project team was able to meet the schedule and achieve LEED Gold certification. The team actively solicited local minority, small and disadvantaged businesses in the preconstruction phase and adjusted the bid packages and scopes to maximize minority participation, achieving 22 percent MBE participation. The pediatric dental center offers routine and specialty services for children ages birth-21 with 11 closed operatories, four open-bay operatories and two sedation suites. 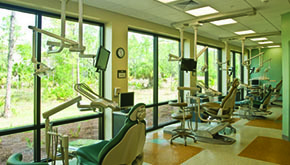 The facility provides dental education opportunities for students who reside in southwest Florida, clinical training for doctoral students and residents of the University of Florida. Faced with an aggressive eight month schedule, the Gilbane team proactively investigated long lead items to determine items of risk and identified a potential issue with the local electric service provider regarding the easement that was started prior to construction. The permanent power would have been compromised resulting in schedule delays. The overall aggressive schedule was updated weekly and the team prepared a three-week look ahead schedule to keep all trades on track and to provide an earlier forecast. Through early detection and communications with the University of Florida, our team was able to present three options and deliver a savings to the owner.